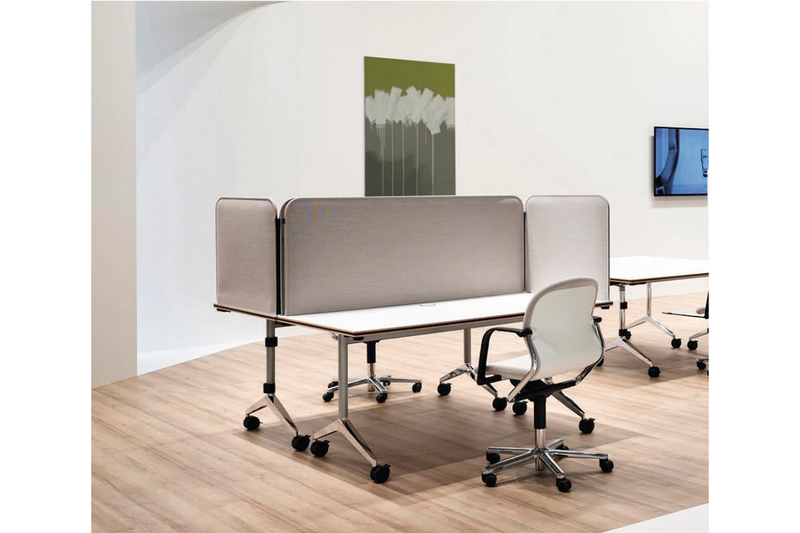 Wilkhahn offers flexible office furniture for quickly adaptable office environments. Today’s office concepts are all about fostering interaction and collaboration. However, projects are often delayed again and again because the rooms required aren’t available straight away. Which is why, way back in antiquity, carpe diem – or seizing the day – was considered an appropriate method of not putting off change. Given the pace with which business environments are currently transforming, carpe momentum is the order of the day. As providing a choice of rooms for any eventuality would be inefficient, concepts are called for that have the right tools and equipment to deliver the required flexibility for spaces. It’s even better if people taking part in a meeting or event can organise, transport and position furniture and equipment themselves. The nature of project work means that the size of the teams involved repeatedly changes depending on what phase the project’s at. Which is why flexible spaces that can spontaneously grow and shrink again are ideal to accommodate day-to-day departmental business and project phases. 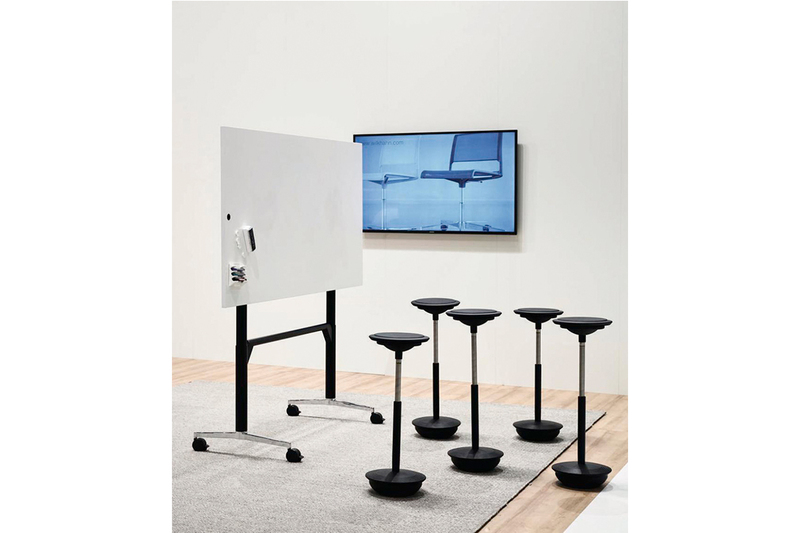 Therefore, Wilkhahn has come up with a mobile and swivel-mounted table, to which a power supply can be attached, to function as a pop-up office. It’s based on the multi-award-winning Timetable seminar table range (design: Andreas Störiko) and comes with an acoustic panel that can be unfolded to provide greater privacy and cut out any visual distractions. Flipped up and nested into one another, each extra table only requires a further 21 cm in terms of depth, making the tables extremely compact to stow away. The table’s child’s play to set up in just a few easy steps. The fact that the table’s high quality, easy to handle and people can set up spaces themselves, expresses appreciation for the workforce, commitment, ensures exceptionally efficient flexibility and best use of space. A mobile table with a swivel-mounted table top and electric height adjustment is the latest member of the versatile Timetable family. To make it independent of a mains power supply, the table has a lithium-ion battery whose capacity is sufficient to operate the table for one whole day. An LED charge indicator and acoustic signal to prompt users to recharge ensure it’s always ready to go. Table formats of up to 200 cm x 100 cm make Timetable Lift ideal for compact hot desking spaces, speakers’ tables, scalable seminar and project rooms and flexible meeting and presentation areas – and for communications and working methods that change. All sizes and types of usage are designed to nurture agility and motivation: the tables are compact to stow away, wheel in as required, easy to set up in one step and adjust to the right height at the touch of a button. The precision-adjustable height starts at a standard level and can adapt accurately to leaning and standing heights before finally stopping at 139 cm: if swivelled downwards, the table top (when it features the optional magnetic panel that can be written on) turns into a whiteboard. And what’s more, writing on it together beforehand when it’s horizontal is a lot more interactive and easier than in the vertical. Nowadays, flexibility is also required where ergonomics is concerned. Case studies on Wilkhahn’s free-to-move-office chairs show that well-being and mental agility improve the more diverse the range of movement and more frequent the change of posture are. Therefore, in addition to 3D-dynamic movement in office chairs, height-adjustable tables are becoming the new standard in offices where a premium is placed on health and people are encouraged to alternate between sitting and standing. The challenge: most of us don’t take up this option because getting up from a normal seating height and adjusting the table height are both too time consuming. Consequently, changing posture always means interrupting what we’re doing. Which is exactly where the latest AT office chair range with its elevated sitting position (ESP) and variety of design options comes in: the models can be used as standard office chairs with full 3D-movement capabilities but can also be adjusted to a seating height of up to 62 cm. The elevated sitting position also provides new additional features: if the patented forward seat tilt is activated, the office chair turns into a dynamic object to perch on while still allowing users to lean on the backrest. By leaning backwards, the tiniest shifts in weight are enough to stimulate the 3D flexibility of the pelvis and allow feet to dangle. On the other hand, the forwards movement doesn’t stop when people sit upright but almost automatically when they stand. Because the table’s set to a greater height from the outset, it’s doesn’t have to be reset at all if people just want to stand for a little while. The impact is enormous: the desired change of posture between standing and sitting is intuitively incorporated into the body’s movements and the workflow. As a result, the extra investment in height-adjustable tables truly pays dividends.